Ah, right, all of that cheating. Let’s today perhaps agree on this: home runs will no longer be the dominant statistic for Hall of Fame votes. Otherwise we sit here whining about the injustice or bamboozlement, the confused voters writing long stupid articles about how they’re going to vote. How about since there’s no quantifiable component of what we mean when we say GREAT, how about we just shift our attention to baserunning and fielding and pitching and number of opposite field singles. Or better let’s just only watch Albert Pujols, who if he’s dirty I’m going to fall onto a sword. Have you read Zach Plague’s book, boring, boring, boring, boring, boring, boring, boring? It’s great, beautiful, greatly beautiful. And did you know that Zach Plague, author, is also Zach Dodson, very talented designer and half of the braintrust behind Featherproof Books? Truth. And a few months back, Zach and I had ourselves a conversation over the INTERNET, and the result is this interview that’s been posted on the also great Please Don’t. The interview discusses failure, ugliness, iced urinals, influences, cliché, and more. 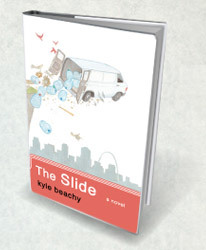 Kyle Beachy’s The Slide, a love story and a portrait of a family in crisis, and Nami Mun’s Miles from Nowhere, a story about a Korean immigrant who runs away from her family at the age of thirteen, have put these two debut local authors on the map. Today they speak with Tony Romano about their work. That’s Saturday at 1:30. Then I’m off to Iowa City for a couple weeks of teaching at the Iowa Summer Writing Festival. I’m told spots are still available for each of the three classes, if you’re inclined. The June HOBART includes a short story I wrote along with a high-resolution photograph of people marching. It is called, “Terror, Not Terror”, and I hope you’ll find a couple minutes to read. And incidentally one of the working titles I had for The Slide was “Yellow, Not Yellow”, which was suggested to me by a friend named Thomas King and then rejected by just about every other person around me, and probably it’s best if one comes up with one’s own book title, I think, unless the equation includes Shirley from Wolfbait in Logan Square, who is a title factory.